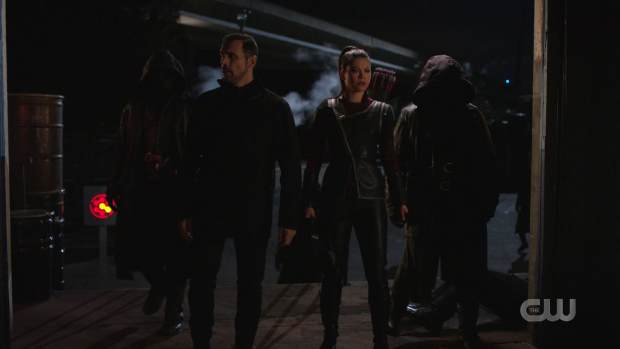 Arrow picks up the thread of Emiko’s dishonesty and introduces another clandestine organisation that represent a large scale threat to the team. This show really loves a secret society. We have seen a number of them over the years with each being more mysterious than the last. The latest is known as The Ninth Circle and their speciality is showing up around the time of regime changes to push things in a direction that benefits them. Naturally Dante is affiliated with them but the more interesting connection is Emiko. Part of the purpose of this episode is to paint a more detailed picture of who Emiko is and where she fits into the mythology of the show. Up until now she has been a fairly mysterious character who has been defined by Robert Queen’s abandonment of her and her mother. Knowing this established a clear baseline for her preference to work alone and her difficulty trusting others. It worked fine even if it was fairly standard characterisation because the underlying motivation made sense. The reveal that she killed Diaz and is working with Dante added extra texture to her character by strongly hinting that there was far more to her than she was letting on. All of this is picked up and expanded though flashbacks detailing her past. The moment she and her mother were abandoned by Robert is shown and is given greater legitimacy thanks to the appearance of Jamey Sheridon which helps make Emiko’s connection to both Robert and Oliver feel more tangible than if dialogue were doing all of the work to slot Emiko into the family tree. It’s easy to see why Emiko would resent Robert so much given how they interact in the scenes they share. The first is when she’s young with Miya Cech delivering an excellent performance that perfectly conveys how hurt Emiko is by Robert casting her and her mother aside in favour of his other children. This scene also adds to the complex tapestry that is the late Moira Queen who pushed for Robert to make a choice regarding which family he was going to favour. This partially justifies the resentment that Emiko has let define her. Flashbacks clearly show why she would gravitate towards Dante given what he could offer her and it’s easy to see why Emiko’s hatred would continue to grow as she gets older. The contrast is clearly shown through how supportive Dante is once he sees that she has skills worth cultivating and how dismissive Robert is. There is added weight to Robert’s dismissal of her viable business plan when he rejects her offer because he’s worried that it would become known that he has an illegitimate daughter. He also holds to the promise that Oliver would inherit the company even though he has no interest in it. The biggest slap in the face comes when he tells Emiko that he wishes Oliver was interested in the business before telling her that he’ll inherit it. This has an undercurrent of white privilege to it as Emiko is willing to put the work in to prove herself and shoe that she’s worthy of recognition where Oliver gets it handed to him whether he wants it or not. None of this is Oliver’s fault and he has definitely changed a lot since then but Robert definitely casts a long shadow and it’s conceivable that Emiko would be so blinded by her bitterness that she applies her disdain for her father to her brother. The reveal that she was the one who destroyed the Queen’s Gambit is a bit of a stretch but makes emotional sense given how deeply Robert hurt her. The treatment she received from Robert is suggested as the beginning of the journey she takes to where she is in her life at this point. Dante offered her an opportunity to learn how to protect herself and also allowed her to be part of The Ninth Circle; a powerful organisation that lets her feel like part of something important. It’s perfectly natural for someone to crave that after being cast aside in the way that she was. More could have been done with her connection to Dante but what was shown was really good. Dante being impressed by her skills when she stole his watch as a kid is a fairly standard beat as far as these sorts of stories go but it’s standard for a reason and sets up the raw talent that can then be developed over time. Not spending much time establishing the dynamic between Emiko and Dante means that it’s difficult to establish a baseline for their relationship. I suspect this was intended to inform the surprise associated with revealing that she was in charge of both him and The Ninth Circle. This makes absolutely no sense as the relationship begins as a clear mentor/mentee connection with nothing to suggest how the roles were flipped and Dante suddenly started answering to Emiko. It looks as if this is supposed to cement Emiko as the central antagonist of the season which is fine as it’s another personal connection for Oliver Queen to deal with as an adversary but this could have been accomplished without placing her at the head of a clandestine organisation that long predates her. Having Dante be the one calling the shots on behalf of The Ninth Circle wouldn’t necessarily undermine the threat she represents and would make narrative sense based on what has been set up. Despite this nonsensical reveal, the way Emiko plays both sides is really interesting. She plays on Oliver’s long standing blind spot for family by doing enough to make him feel sympathetic towards her. It’s easy to make Dante out to look as if he’s oppressing her in some way and frame herself as a victim who needs help to escape a bad situation. This is the sort of stuff that Oliver eats up normally as he likes to be the one to rescue others from situations they are unable to escape themselves. 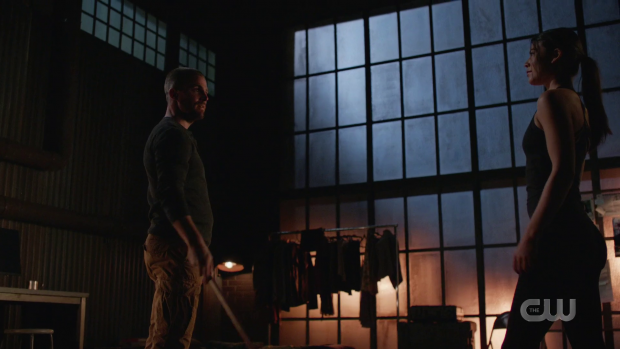 The training sequence early in the episode also highlights this blind spot as Emiko has managed to make Oliver feel comfortable enough around her to let his emotional guard down. She shares little morsels of information with him to make him think he’s getting through her walled exterior but not enough for him to truly know her. This keeps him interested and off guard as he’s thinking about the difficult life she has lead while shouldering some of the blame for it. Emiko plays a really clever game with Oliver here and it works brilliantly because it plays on Oliver’s established weaknesses in a really specific way. Another angle she is playing is Rene who has grown to trust her and is willing to vouch for her at any given point. Oliver wants to be cautious but also wants to trust her and Rene is in the background talking about Emiko’s difficult life making her reluctant to fully engage with the team. He does end up regretting that when she shows her true colours and he realises that he has been played just like everyone else. Emiko really did a number on Team Arrow through careful manipulation of the situation and their desire to see the best in her because of her blood connection to Oliver. This makes her a clever and engaging villain without her being in charge of a clandestine organisation that is far too big for her to have that kind of seniority especially over the man who trained her. The beauty of how Emiko’s true allegiance is revealed to Oliver is how complex it is. He has to wilfully ignore his instincts when trying to trust her. It’s clear to him that her story doesn’t add up but he’s trying to give her the benefit of the doubt. This means that he’s always on his guard and takes the possibility that she might be up to something very seriously. His quick reaction when he discovers the jammer and she tries to gain the upper hand on him shows how alert he is around her and the fact that he doesn’t seem all that surprised shows that he never got to the point where he completely trusted her. Evil Laurel is the one to bring evidence of Emiko’s dishonesty to Oliver’s attention. She acts on the information she gained in a prior episode and tells Oliver that Emiko was the one who killed Diaz. The scene they share is a further testament to how much she has changed as she was looking to tell Felicity in order to spare Oliver’s feelings for a little while. This level of consideration for the feelings of someone else would have been unthinkable for this character not so long ago but she is developing in impressive strides while maintaining the edge that once defined her. The way she almost immediately abandons the idea of letting the information be filtered through Felicity and tells Oliver the truth is completely in character for her and allows the plot to move forward. Naturally Oliver is resistant to the idea that Emiko killed Diaz and tries to come up with ways to justify it to Evil Laurel as well as himself. It’s a strong scene and leads to an interesting Team Arrow debate where they discuss how far Evil Laurel has come and whether killing Diaz is such a bad thing. There are so many layers to all of this that it’s almost hard to keep track but it’s great to see the writers exploring as many angles as possible. Emiko acts as a strong antagonist for Evil Laurel as she is able to attack in fairly unexpected ways. The episode plays up the difficulty she has working within the confines of the law through how she threatens a witness and generally forgets that she has a reputation to uphold. As always this makes for a fun back and forth between her and Dinah who are very much at opposite sides when it comes to adherence to the legal system. Dinah sees the deputisation of Team Arrow as an opportunity to make the city safer than it ever has been so very much argues from that point of view where Evil Laurel is interested in results no matter what it takes to deliver them. Emiko leaking pictures of her with Diaz into the public domain represents a compelling threat to Evil Laurel’s legitimacy and it will be interesting to see how this progresses. The march towards the dark future continues as Felicity looks to expand the ARCHER software beyond its current application. She recruits Alena to increase the brain power she has access to. As with many terrible things this starts as something meant to be used for good that will definitely spiral out of control. Emiko certainly has an interest in it which suggests to me that she’s in some way responsible for it being used in the way we’ve seen in the future. Either way Felicity seems somewhat blinded to its problems because of her desire to use it to protect people. Alena’s interest is ill developed and doesn’t extend much beyond wanting a job that makes use of her talents. Leaving this in the background for now is the right way to do this as it allows it to be a background detail adding texture to the season before becoming instrumental later on. A strong episode that focuses on justifying Emiko’s actions and her allegiance without ignoring the complexity associated with it. The recent reveal that she is working with Dante is expanded on through flashbacks that show the beginning of this connection. It comes after Robert Queen abandons Emiko and her mother at the request of Moira. It’s easy to see why Emiko would resent her father after this especially when he dismisses her well thought out, clever and legitimate business plan because he’s afraid of the public finding out the truth. There’s an undercurrent of white privilege here when Robert states that Oliver will inherit the company even though he has no interest in it. This is the ultimate slap in the face that makes it easy to understand why Emiko would dedicate herself to Dante and what he can offer her. It makes absolutely no sense that he would end up being her boss and in charge of the latest clandestine organisation and it’s a bit much that she was the one responsible for blowing up the Queen’s Gambit but much of this makes emotional sense. The way she manipulates Oliver by exploiting his blind spot for family works really well because Oliver’s reaction to the situation is very nuanced. He doesn’t entirely trust her but also wants to protect her. Emiko plays on that and achieves much of what she set out to do as a result. The fact that Oliver isn’t surprised is telling of his suspicions but he is also somewhat blind sided by wanting to believe her. Evil Laurel telling Oliver that Emiko killed Diaz works really well as it moves the plot forward while serving as a reminder of how far she has come. She wanted to filter the information through Felicity but abandons that idea when Felicity isn’t around which makes for a compelling scene where Oliver tries to defend Emiko. This then leads to a great Team Arrow discussion where they debate how far Evil Laurel has come as well as debating whether killing Diaz is really all that bad a thing. Emiko serves as an intriguing antagonist for Evil Laurel in the way she offers a challenge. The episode also plays up Evil Laurel’s difficulty staying within the law by putting her in opposition to Dinah which shows that she can be a bit sloppy in the way she conducts herself. Emiko leaking images of her with Diaz to sully her name is a compelling attack that has a lot of potential in the coming episodes. Felicity’s work on ARCHER continues to build in the background serving as a reminder that a dark future is on the horizon. As with many terrible things this starts with good intentions and it’s clear that it will be taken from Felicity to be used for something counter to its intended purpose. It’s also clear that Felicity is blinded by her intentions to the potential drawbacks.